This Creamy Pumpkin Pasta is ready in under 30-minutes and is so delicious. 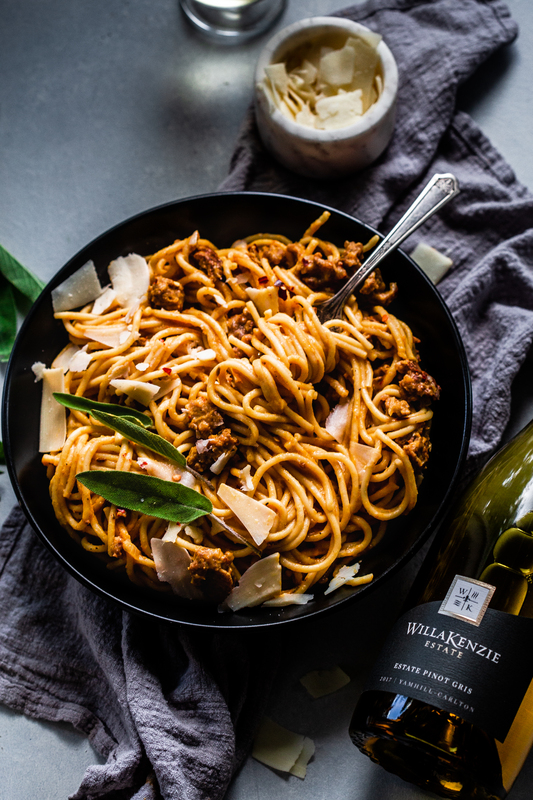 Pair it with a zippy glass of WillaKenzie Pinot Gris to cut through the richness of the dish for a perfect weeknight meal. Erin Lynch of Platings & Pairings shares with us this fall-tastic recipe for a creamy pumpkin pasta. A dish she describes as "...basically a comforting hug in a bowl… or a plate, depending on how you like to serve up your pasta. 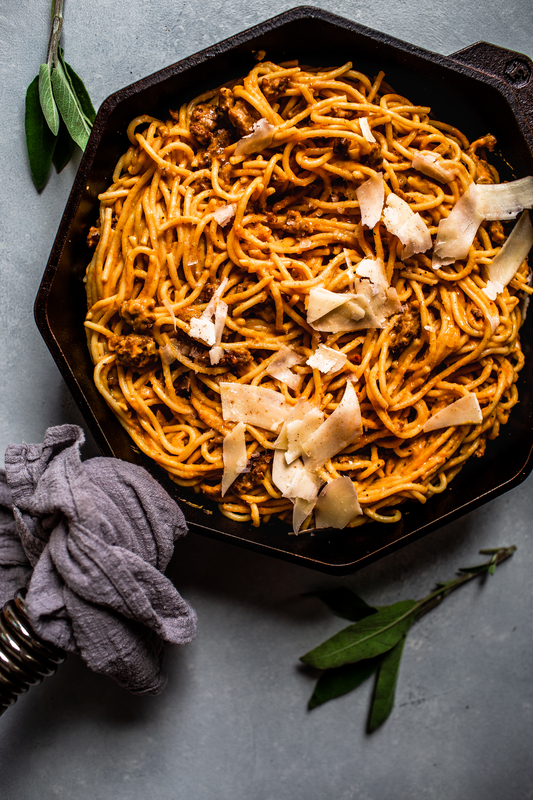 Sometimes you might just eat it straight out of the pot…Regardless of how you choose to dish it up, I’m pretty sure that you’re going to instantly fall in love with this pumpkin pasta. It’s the best." While you can opt to roast a local pumpkin to make the purée for the sauce, canned pumpkin purée is perfectly acceptable and keeps this dish ready in under 30-minutes. Why is this the BEST pumpkin pasta? It’s rich and creamy and delicious. It’s laced with smoky, crispy little bits of sausage. It’ll be on your dinner table in under 30 minutes. Here you can top the pasta off with some shavings of parmesan cheese to add a nutty, umami note to the dish, along with fresh sage leaves to really boost the autumn flavors. For the sausage, depending on your preference, either mild or hot Italian sausage works. For vegetarians, just omit the sausage! Leaving the sausage out also makes it more appropriate as a side dish, potentially alongside your Thanksgiving turkey. Find the full recipe on Platings & Pairings. The creamy sauce that’s dressed this pumpkin pasta dish works really well with a bright and mineral-driven wine as it'll help cut through the richness of the dish, but won’t overpower it either. 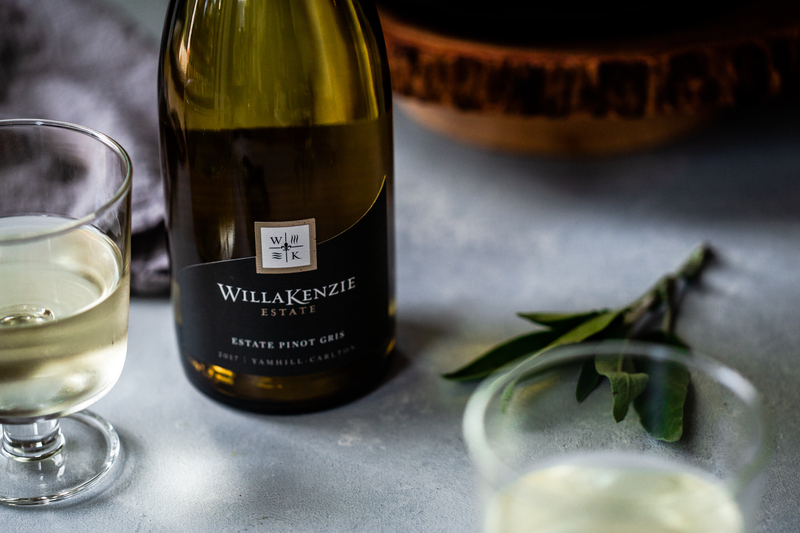 We chose our 2017 WillaKenzie Estate Pinot Gris for the pumpkin pasta as it's delightfully bright with fantastic minerality, but also has a round finish. It was just the right pairing to lighten the sauce, and complement the fresh sage with its hints of citrus and tropical fruit.